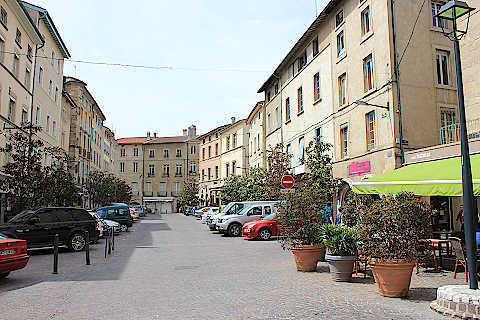 Romans-sur-Isere is a large town 18 kilometres north-east of Valence in the Drome region and with the Vercors mountains in the distance. 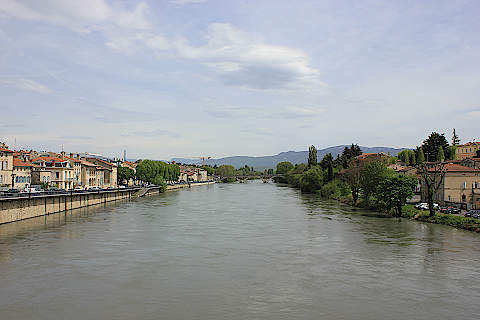 Romans is separated from its sister town of Bourg-de-Peage by the pretty fast-flowing Isere River and best known for it’s longstanding tradition of shoe making. France This Way comment: although it is not a typical tourist destination, there are enough attractions to warrant an afternoon visit, in particular the Collegiale church. 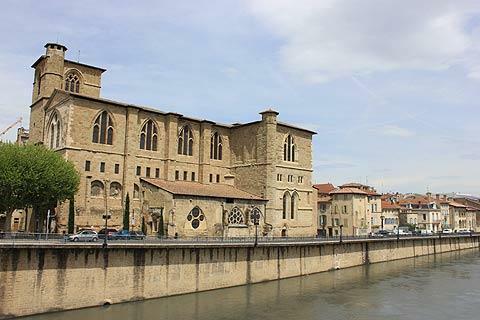 The collegiale church of Saint-Bernard was built on the banks of the river Isere in the 12th century after an earlier church had been destroyed by fire. 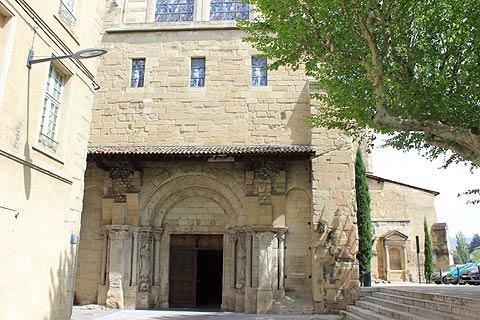 While parts of the original roman style church can still be seen, much of what we see today is a substantial 13th century reconstruction in gothic style, and a further rebuilding from the 16th century onwards after the church was damaged during the Wars of Religion. The facade, belltower and decorative stonework of the entrance are the highlights outside. Unfortunately the adjacent cloisters were damaged in the years after the revolution, and then demolished to make way for a port on the river. 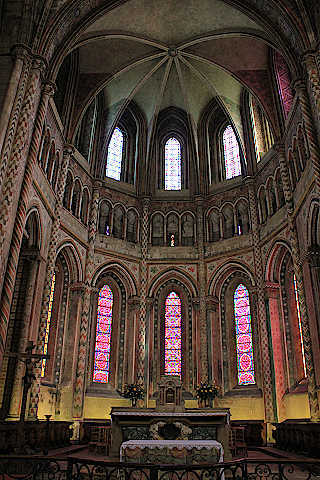 Inside the church it is the the beautifully decorated choir is well worth a look. 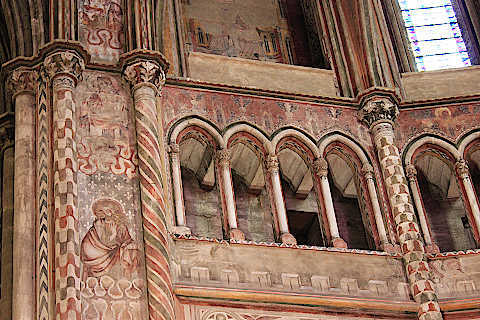 The choir has been restored to reveal the paintings and show what it would have looked like in the 14th century. Unfortunately the paintings are wall paintings and not frescoes which means the pigments were not fixed in the way they are when frescoes are made and have deteriorated in quality. Even so it is beautiful and should not be missed. Another highlight in the church are the tapestries in the Chapelle de Saint-Sacrement. There are nine large tapestries dating from the first half of the 16th century and depicting the 'Mystery of the Passion'. They start with a scene of Christ in the olive garden and finish with the Resurrection. 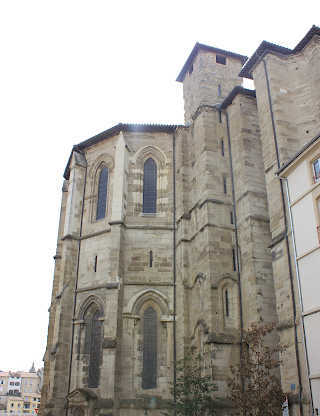 Another monument in Romans-sur-Isere is the Jacquemart Tower. Originally a 12th century gateway through the town ramparts to enter the fortified town, the ramparts have now disappeared, and in 1429 the gateway was blocked up and the tower turned into an imposing clocktower. Jacquemart refers to a clocktower where an automated character emerges to strike the time each hour - hence the bell and spire on top of the tower. Within the rest of the old town you can see various medieval and renaissance style houses dating from the 14th to 16th centuries. Among the more unusual highlights is the International Shoe Museum, housed in a wonderful former convent with Italianate architecture and a large decorative courtyard, and containing hundreds of examples of master craftsmanship dating from ancient times to the modern day. It is a must for any serial shoe-shoppers. The history of shoes over the centuries and around the world is on display, from the horrors created for bound feet in China to some wonderful creations designed by leading shoe-makers of modern times. 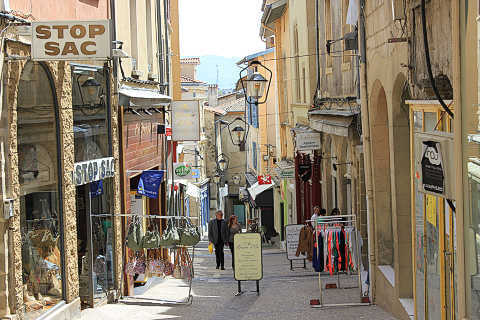 Aside from the numerous shoe factory outlets selling the high-quality footwear normally reserved for Paris boutiques, Romans-sur-Isère is a haven for dedicated followers of fashion. Marques Avenue is one of the two large discount shopping complexes in the town, offering many international brands such as Le Creuset, Levis and Puma at bargain prices. 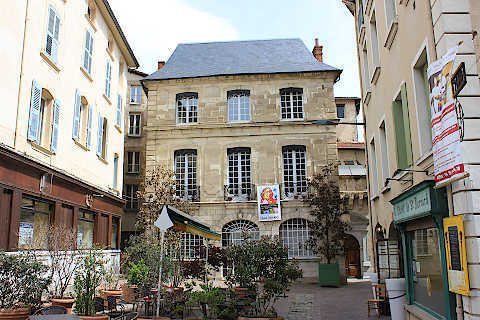 The tanning industry was important in Romans-sur-Isere in order to provide leather to the shoe factories and you can see the ancient tanning houses in the Quartier de la Presle. 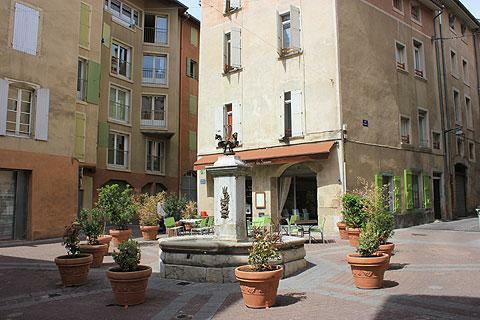 Another tasty attraction of the town is the famous Pogne. This ring shaped orange-flower bread is a tradition of the town and where better to discover it than the Museè de Pogne located in the town! A perfect accompaniment to a picnic whilst you relax in the riverside park, and sample some of the peaches and apricots this region is also famed for. 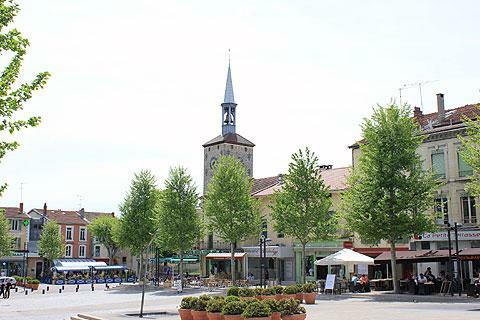 The weekly market in Romans-sur-Isere takes place on Friday and Sunday mornings in the Place Maurice Faure. 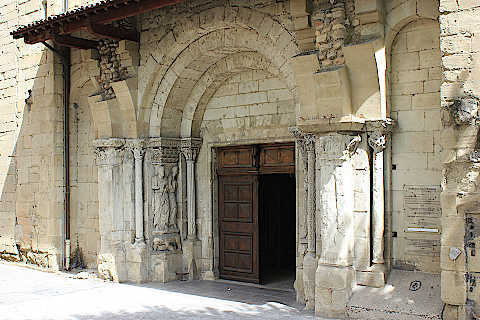 Particularly recommended is the very extensive collection of statues and other religious artefacts at the Museum of Sacred Art, in a roman style church at Mours-Saint-Eusèbe just north of Romans-sur-Isere. To the south of the town you can visit the unusual circular village of Alixan. 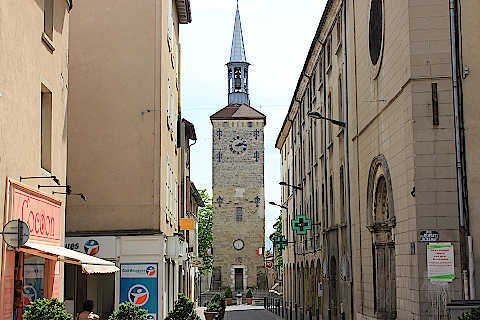 The three rings of the village circle around a raised central area that once held a castle, now replaced by a church (a small part of a castle tower can still be seen, now part of the mairie).